Observations with an infrared-sensitive instrument at the ESO 3.6-m telescope at La Silla have for the first time shown the presence of a disk around a hot and massive star, known as G339.88-1.26. Until now, disks have only been found around less massive stars. Planets are formed in such disks. The new discovery may thus have important implications for our understanding of the formation of planetary systems around stars. Observations at mid-infrared wavelengths were carried out in July 1997 by Bringfried Stecklum (Landessternwarte Thüringen, Tautenburg, Germany) and Hans-Ulrich Käufl (ESO), using the TIMMI instrument at the ESO 3.6-m telescope. Additional measurements were carried out in March 1998. TIMMI (T hermal I nfrared M ulti M ode I nstrument) is a general-purpose camera spectrometer operating at a wavelength of 10 µm. To reach sufficient sensitivity, the camera must be cooled to approx. -260 o C, i.e. a few degrees above the absolute minimum, by use of liquid Helium. Astronomical objects whose temperatures are between -120 o C and 300 o C radiate most of their energy at this wavelength. In addition, dust and haze that are absolutely impenetrable for light visible to the human eye, are often found to be nearly transparent at this wavelength. This is why fire-fighters now use similar equipment to look through smoke. 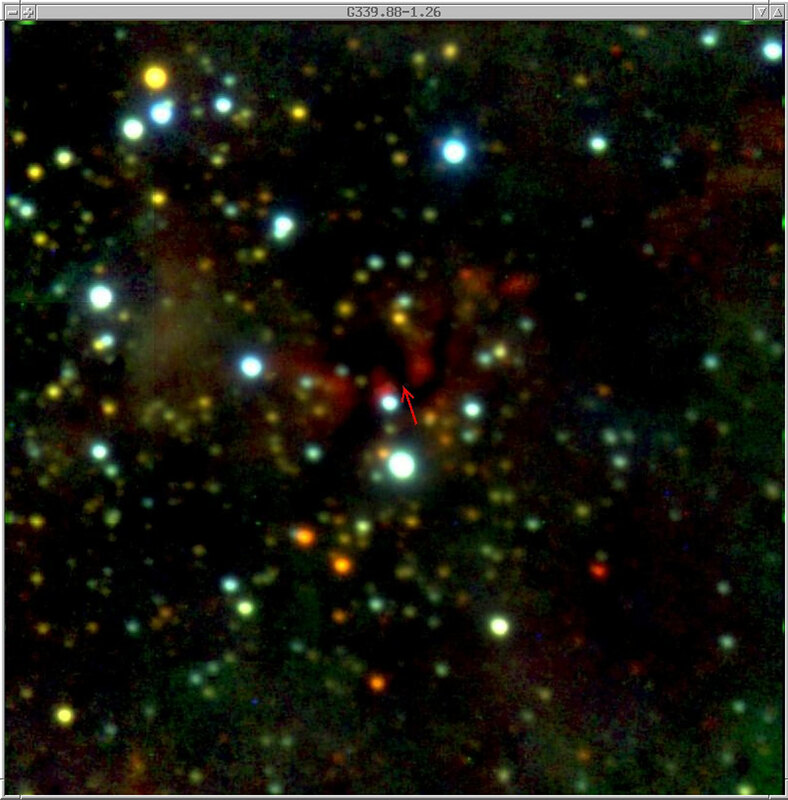 Earlier observations with radio telescopes of the object G339.88-1.26 , deeply embedded in an interstellar nebula, had been interpreted in terms of the possible existence of a circumstellar disk around a high-mass star. It was concluded that the star responsible for heating the surrounding gas must be very hot and also that it must be intrinsically very bright. The star, most likely of spectral type O9, would have a luminosity 10,000 times higher than that of the Sun and a mass of about 20 times that of the Sun. From the measured velocity, the likely distance of this object is about 10,000 light-years. The object is associated with several "spots" of very strong radio emission from methanol molecules (methanol masers). Interestingly, they form a chain in the sky and the measured velocities of the individual spots are indicative for orbital motion in a rotating disk around the central star. The new TIMMI observations of G339.88-1.26 showed an elliptical object with strong infrared radiation. The peak of this radiation (as seen in the sky) coincides with the peak of the radio emission. Furthermore, the apparent orientation of the disk is well aligned with that of the methanol maser "spots". There is little doubt that this object is indeed the infrared image of a circumstellar disk, viewed at an angle. As far as known, this is the first direct image of a disk around a very massive star. At a wavelength of 10 µm, however, the central star that is responsible for heating the dust disc, cannot be seen in spite of its rather high luminosity. This is because it radiates mostly in the ultra-violet part of the spectrum. Moreover, the dust disk in which the hot star is embedded, absorbs the stellar ultraviolet light extremely efficiently, thereby re-emitting this energy in the infrared. And any stellar light that escapes the dust shroud is in any case completely blocked by intervening interstellar material in the nebula. The formation of disks of dust and gas around young stars is now considered to be a normal feature of star formation. This is well established for stars of about the size and mass of our Sun. However, until now there has been no direct evidence of such disks being also formed around young massive stars. In view of the extremely high luminosity of such massive stars, any surrounding disks are subject to a fierce attack by the enormous flux of light to which they are exposed. Hence the existence of such disks around massive and luminous stars has been questioned by astronomers interested in the physical process of star formation. The discovery of the disk around G339.88-1.26 now settles the question whether such disks can indeed be formed and are stable over periods long enough that they can be observed. 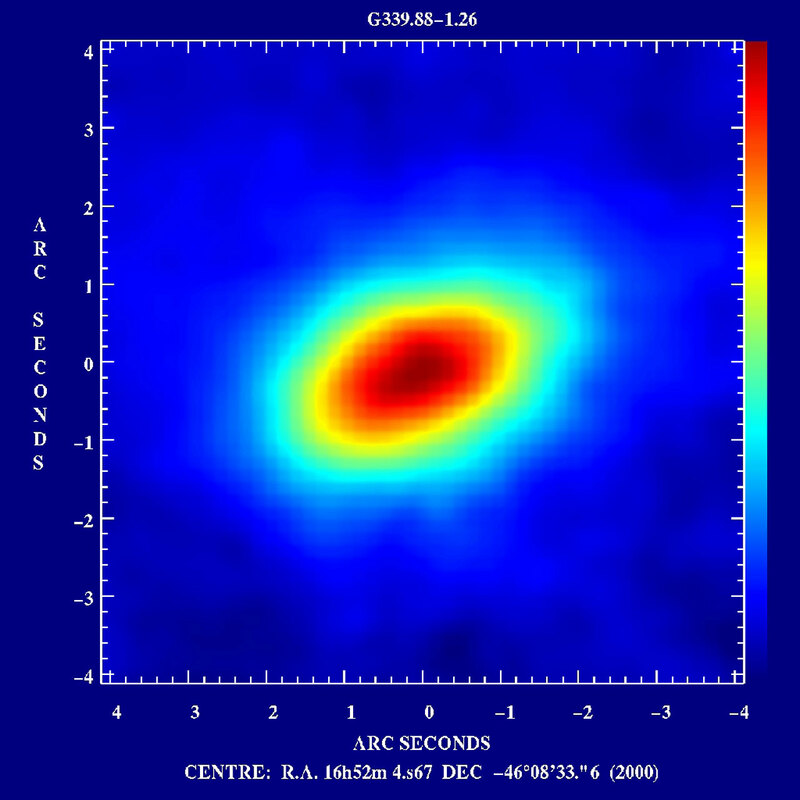 Supplementary measurements to investigate the molecules and dust around G339.88-1.26 have been performed with the SEST submillimeter telescope at La Silla in March 1998. 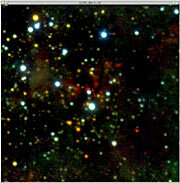 Near-infrared images have also been taken at the NTT and at the 2.2-m telescope. The team responsible for this project also includes Thomas Henning and Markus Feldt (Astrophysikalisches Institut & Universitäts-Sternwarte, Jena, Germany), Andreas Eckart (Max-Planck-Institut für extraterrestrische Physik, Garching, Germany) and Lars-Åke Nyman (ESO).